Glass is made of one of the most common materials on earth which, like words, musical notes or blobs of paint, is worth nothing in the hands of people who don’t know what to do with it. But add knowledge and creativity and you get something that is very rare indeed. 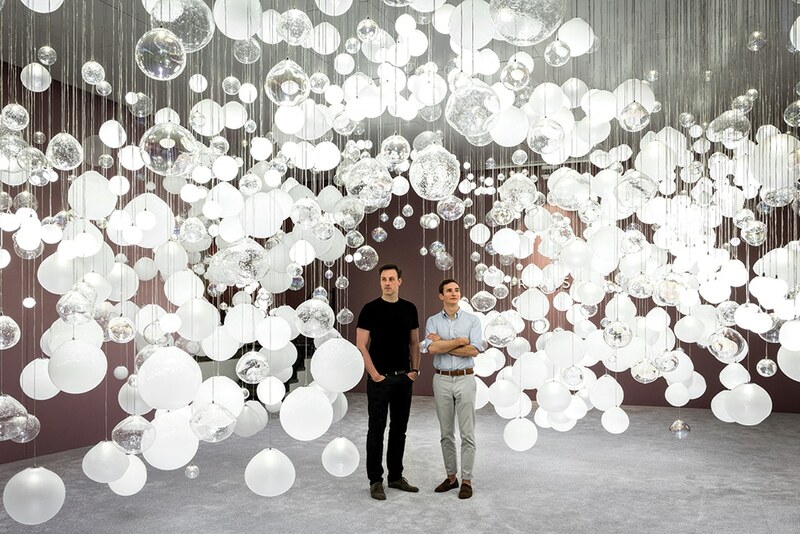 Featured photo: Andreas Klug & Michael Vasku amidst the awe-inspiring, interactive Breath of Light installation by Preciosa at Salone del Mobile, 2018. If you breathe on it, your breath travels as light across the entire installation. The installation was awarded a Red Dot: Best of the Best 2018 for outstanding design quality. Michael Vasku is one of the key names in Austrian and Czech design, his reputation having spread throughout Europe and beyond, in large measure, though his work (along with Andreas Klug) as Creative Director of Preciosa, the Bohemian glass company founded in 1724. Although Michael has been successfully involved in education, especially in the Faculty of Multimedia Communications at the Tomas Bata University in Zlin, and makes up half of the award-winning Vasku & Klug architectural and design partnership, his professional life (so far, because he is still a young man) is more closely associated in the public mind with Preciosa Lighting. The company’s main production facilities are located in the Bohemian region known as Crystal Valley, where the history of glass making goes right back to the Middle Ages, and which is still one of the most important areas in the world for the making of glass chandeliers. 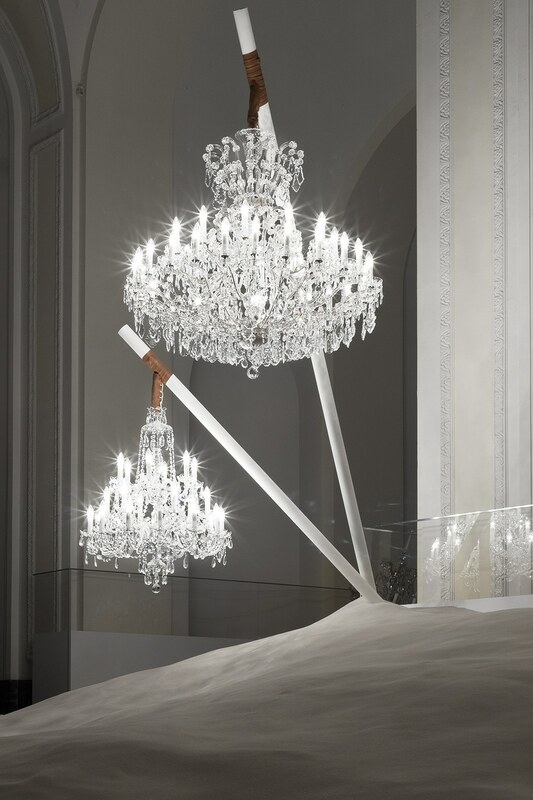 While the company makes chandeliers for public buildings, palaces, exhibitions halls, private houses and even luxury yachts, the work of Michael Vasku is probably best seen in his installations, from his Behind Locked Doors show in the Hofburg Palace in Vienna in 2014 to his Breath of Life interactive installation at Milan’s Salone del Mobile 2018. Above: Behind Locked Doors – an installation by Vasku & Klug in cooperation with Preciosa in the foyer of the Hofburg Palace, Vienna. In speaking of your Hofburg Palace installation, you don’t stress the incongruity of 60 tons of sand and eight exquisite chandeliers, which to us was the most relevant aspect of the show. Was this deliberate? Actually we stated that the exhibition displayed 158 Chandeliers, which included eight hanging chandeliers and the material – crystal silica sand – for about 150 chandeliers, which had not yet been produced. In fact, the silica sand from the exhibition was transported back to the factory where it was used for producing chandeliers the following winter. You appear to be as interested in design cultures worldwide as in mid-European design. Is that at odds with your natural desire to promote the latter? I believe one can only understand the relevant qualities of their own culture, not only design culture, once they see how it relates with others. Different design cultures are, of course, not isolated entities. History proves that easily. It’s extremely inspiring and interesting to understand where certain ideas in different cultures originate and how they are adopted. Designers can speed up such processes. Does your creativity for installations derive from your day-to-day work, or vice versa? Above: Muutos: the design of this light stems from hundred-year-old wooden moulds, used historically in glass blowing. Each Muutos piece is hand-blown by Preciosa masters. Your interdisciplinary approach to design is reminiscent of the Bauhaus. Is this a valid observation? The Bauhaus was certainly the most salient representative of it, although I prefer to look at the decades before the Bauhaus, which was what also, very probably, inspired the Bauhaus professors. You find this interdisciplinary approach in the concept of the “Gesamtkunstwerk”, a German word which has been adopted by many languages and can be translated as “total work of art” or “synthesis of the arts”. This is a widely known form from the Art Nouveau period, but you’ll see very similar approaches from Renaissance artists like Michelangelo. 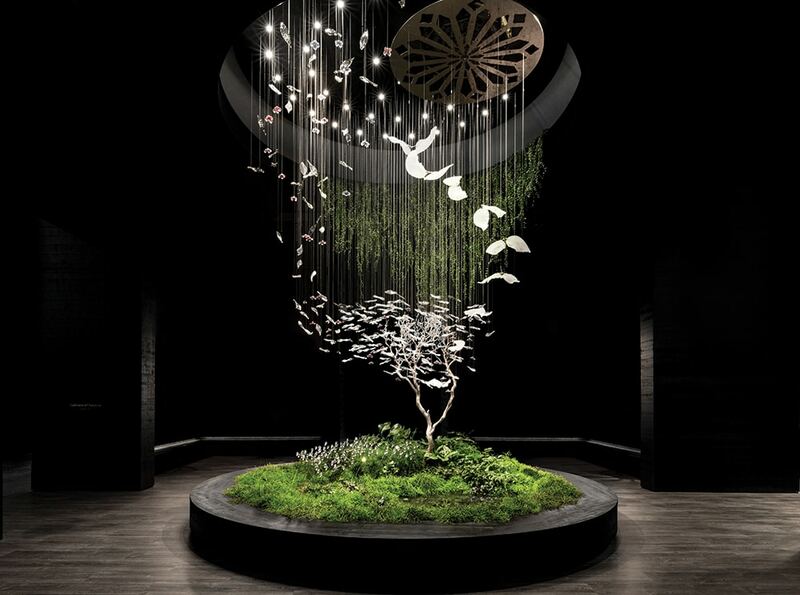 As creative director of Preciosa Lighting, do you have total creative freedom? It’s important to me to point out that I share this position with Andreas Klug, my friend and business partner at our studio Vasku & Klug. Certainly we don’t have total freedom, because in such a position you need to respect constraints. But what I really enjoy is that we ourselves create these constraints. Should a great chandelier be as beautiful with its lights off? There is no general answer to the question. Chandeliers need light, either natural or artificial. Historically, crystal chandeliers were often hanging so low in front of the windows that the sun illuminated them and created truly amazing effects. Above: Cultivation of Chandeliers – Crystal Biosphere: this installation tells the story of natural life. It consists of three concepts that work as a single unit as well: Crystal Tree, Crystal Field and Crystal Automata. What do you think you’ll be best remembered for? Let’s put it this way: my aim is to share my passion, make people smile and make their eyes sparkle with my work. If I achieve that, I’ll be happy. Do you have a chandelier in your bedroom? No, personally I’m a radically formal minimalist.